Sometimes when a band tries to evolve, they fail miserably. I can count a few times when I was beyond excited to get a hold of a band’s latest, just to feel like someone stomped on my dog. Let-down, hurt, even feeling abandoned, I am generally no longer a fan of these groups. I felt this way when The Strokes released their First Impressions of Earth album. “Sell-outs that lost what made them awesome!” I proclaimed. But alas, here I am 5 years later listening to their latest, Angles and I’m really torn. The Strokes were rad when they hit the scene because they were different. Simplicity combined with a raw sound made something that was quite unique at the time. Angles isn’t as raw or unpolished as their early stuff, but they crank the creativity up and it pays dividends if you’re into different sounds. “Two Kinds of Happiness”, for example, has a decidedly 80’s vibe echoed drum beat, whiny vocals and all. The next track, “You’re So Right” would fit in with a new Radiohead album, and “Gratisfaction” is a straight feel-good yearly 70’s Classic-Rock tune. As you might expect, the whole experience is a bit scattered. If you like cohesive flowing albums, as I do, this one may not be for you. 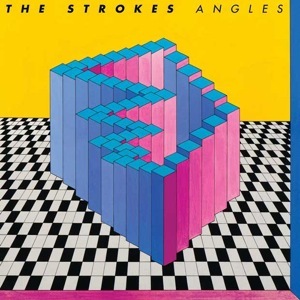 However, if you have varying musical thirsts that only many sounds can quench, The Strokes’ Angles does the trick. That is if you can forget about what made The Strokes great and embrace their new, albeit pretty fun, sound.